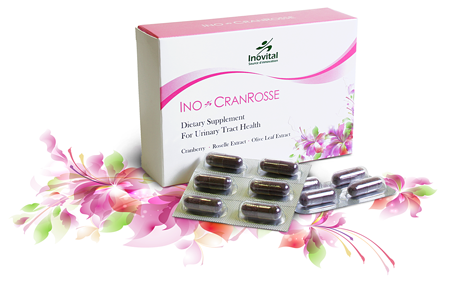 Ino CranRosse is a unique combination of Roselle Calyx Extract, Cranberry Extract and Olive Leaf Extract with proven benefits for females’ urinary tract infection (UTI). Roselle Calyx Extract and Ocean Spray Cranberry Extract enrich with proanthocyanidine and organic acid that can acidify urinary tract, unbalance growth environment of the bacteria, and promote health of urinary tract. The Oleuropein is a major active ingredient in Olive Leaf that consists of anti-inflammatory and antioxidant properties which can enhance the immune system to fight the pathogen. To relieve symptoms of UTI : Take 1 capsule each time, 2 times daily.